Millions of customers worldwide had their messaging and email service disrupted with many turning to Twitter to express their anger. In a press conference at 15:00 BST, Mr Lazaridis said the company would now begin a full investigation of what happened. He apologised again for the problems customers had experienced. "We know we've let many of you down. You expect more from us. I expect more from us," he said. The firm admitted that it was the largest crash it had ever experienced. Prior to the 2011 problems, the last significant blackout was in 2009. The next priority would be a "root cause analysis" of why there was a core switch failure within RIM's infrastructure. "We don't know why the switch failed and why the back-up didn't function as it should," said Mr Lazaridis. In a question and answer session following the press conference, RIM declined to discuss whether it would be compensating users. Some operators, such as Telefonica owner of the UK's O2, are mulling whether to provide compensation for affected users. Users began to report loss of services mid-morning on 10 October and the problems spread around the world. Robin Bienfait, chief information officer of RIM, the Canada-based owner of Blackberry, issued an apology for the ongoing issues, following complaints that the firm was not informing users about the situation. "You've depended on us for reliable, real-time communications, and right now we're letting you down. We are taking this very seriously and have people around the world working around the clock to address this situation," he said on Wednesday. 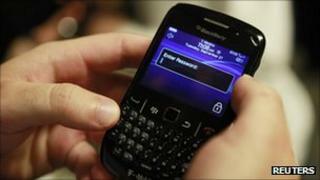 RIM blamed the ongoing issues on a backlog of emails to Europe from Asia and the Americas. "Clearly we have a backlog in Europe... as you can imagine, with the global reach of Blackberry and people using it to contact others around the world, there's a lot of messages to Europe from Asia and the Americas," RIM software vice president David Yach told a press conference in Ottawa, Canada. "Over time that backlog has built up and affected our other systems." The server problems are believed to have originated at RIM's UK data centre in Slough. Media captionBBC's Rory Cellan-Jones: "Blackberry has so many high profile users who are complaining about the crash"
Such a major failure will come as unwelcome news to RIM, which has been losing market share to smartphone rivals - in particular Apple's iPhone. Malik Saadi, principal analyst at Informa Telecoms & Media, said the timing of the outages was bad for RIM.